In the half decade since the beginning of the economic crisis, global press freedom has declined, and the EU has been no exception to this trend. Reporting on a new survey on press freedom, the authors find that Greece and Hungary have experienced large declines in press freedom in recent years, with Lithuania, Latvia and Spain also seeing falls. They write that the economic crisis has exacerbated deep-rooted problems across Europe’s media environments leading to a decline in print media circulation and diversity, as well as a greater concentration of media ownership. Each year in May, Freedom House, a Washington, D.C.–based institute that specializes in research on global democracy, issues a report on the condition of press freedom around the world. The most significant—and disturbing—finding of Freedom of the Press 2013: A Global Survey of Media Independence was that the proportion of the global population that enjoys a free press continued to decline in 2012, falling to less than one in six, its lowest level in over a decade. 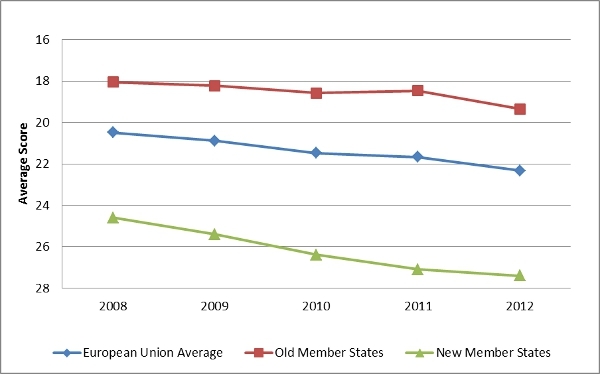 The press freedom score in the European Union (EU), traditionally one of the world’s best-performing regions, also fell victim to this negative trend, with a further drop in the regional average and declines in both the old member states and those that joined the bloc in 2004 or later. 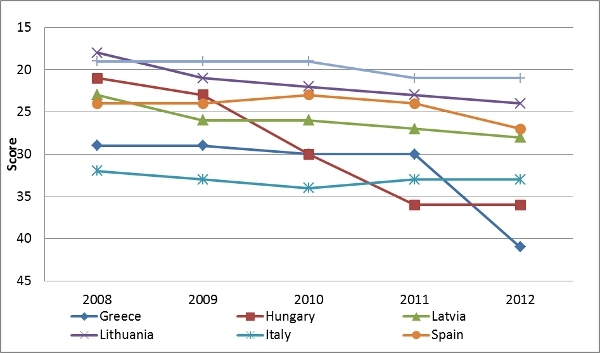 The year 2012 featured a notable deterioration in Greece and more moderate declines in Spain and other nations. This comes on the heels of a steep decline in Hungary’s score in recent years, and ongoing problems in Italy, Latvia, and Lithuania. As governments and media sectors felt the impact of the economic crisis that began in 2008, the state-run and private media suffered staff and salary cuts, declines in advertising revenue, and even the closure of outlets. This in turn had the effect of exacerbating existing problems, such as declining print circulation, the concentration of media ownership, decreasing print media diversity, and expanding influence on content by political or business interests. Scores are on a scale of 0–100, with 0 as best and 100 as worst. Categories: Free (0-30), Partly Free (31-60), and Not Free (61-100). Greece’s score decline was the largest in the region in 2012. It fell from 30 to 41 on the survey’s 100-point scale, triggering a change in the country’s press freedom status, from Free to Partly Free. (The third category in the three-tiered system is Not Free.) While Greek society as a whole suffered from economic and political turmoil, the Greek media endured widespread staff cutbacks and some closures of outlets. Journalists also faced heightened legal and physical harassment and pressure from owners or politicians to toe a certain editorial line. These factors damaged the media’s ability to perform their watchdog role and keep citizens adequately informed about election campaigns, austerity measures, corruption, and other critical issues. In one prominent example, journalist Kostas Vaxevanis was arrested and charged with violation of privacy for publishing the so-called Lagarde List of prominent Greek citizens who had transferred funds to Swiss bank accounts, allegedly to avoid paying taxes in Greece. Although he was initially acquitted, he currently faces a retrial. Furthermore, there were cases of politically motivated firings and suspensions at both state and private media. Journalists were physically attacked while covering protests against government-imposed austerity measures, and targeted by the far-right Golden Dawn party. The media environment in Spain has also suffered as a result of the economic crisis and a related series of austerity measures, with its score declining from 24 to 27 points in Freedom of the Press 2013—still in the Free range. Media diversity was affected as the advertising market contracted and a number of outlets closed, cut staff, or reduced salaries. Since 2008, 57 media outlets have closed, around one-sixth of the country’s journalists have lost their jobs, and those who remain receive only about half their precrisis salaries. Público, a left-leaning daily aimed at younger readers, stopped printing and switched to an online-only format in February 2012, leaving El País as the only major left-leaning newspaper in print. In addition, several journalists and staff at RTVE, the state-owned broadcaster, were removed after voicing criticism of the government’s controversial austerity policies. These developments raise significant concerns about political influence over content and a lack of diverse viewpoints in the mainstream media. Latvia’s score has fallen to 28, three points shy of the Partly Free category. Declining advertising revenues since 2008 have caused media outlets’ budgets to shrink, resulting in tabloidization and the use of recycled content. Forced to search for new sources of income, some outlets have engaged in the questionable practice of “hidden advertising,” in which paid content is improperly disguised as news. While the country’s economic recovery has accelerated in the past two years, media ownership is becoming increasingly concentrated. Apart from economic problems, political interference in editorial policies has raised concerns, and the country is battling a growing trend of violence against journalists. The 2010 murder of newspaper owner Grigorijs Ņemcovs remains unsolved, and last year another journalist reporting on corruption and organized crime was badly beaten and shot at. Latvia’s Baltic neighbor, Lithuania, was also severely hit by the economic crisis, and its media sector suffered similar setbacks, though it is still ranked comfortably in the Free category. While the economy is currently performing well, Lithuania’s media and advertising sectors have not yet caught up. Media ownership has grown more concentrated over the last several years, and the industry’s recovery has been hampered by rising taxes on media outlets. Banks are barred by law from owning media, but many institutions work around those restrictions by maintaining media holdings through intermediaries, and newspapers controlled by financial institutions often demonstrate bias toward their owners. A number of politicians also have ownership stakes in media outlets. Italy did not suffer a decline in score for 2012, but it has been a regional outlier since 2008, when it fell into the Partly Free range due in large measure to the disproportionate influence of one man—then prime minister Silvio Berlusconi—over the country’s media. Berlusconi is a major private media owner, and his political position gave him control of the state-owned media as well, including influence over the appointment of directors and key journalists. While his resignation in November 2011 effectively decreased media concentration, Italy’s score did not improve significantly. It remained at 33 in 2012, with a Partly Free status, due in part to pressures from the economic crisis. Working conditions for journalists have become difficult in recent years; those with a full-time contract constitute only 19 percent of the workforce, and there is a significant pay gap between professional and freelance journalists. Those hoping to work full-time for one of the major outlets need a license from the journalists’ association, the Ordine dei Giornalisti, and obtaining one entails a lengthy and costly procedure. Other problems include the influence of political parties over nominations to the public broadcaster and the regulatory authority. This infamous phenomenon is called lottizzazione, or “dividing the spoils” between parties, and has long plagued Italian politics. Journalists also face physical threats or attacks from organized crime networks. In one case, investigative journalist Roberto Saviano has lived under 24-hour police protection since publishing the book Gomorrah, about the Neapolitan mafia, in 2006. The relatively young democracies of the EU’s east and south have endured the worst press freedom setbacks in recent years, but even leaders of the democratic world like the United Kingdom are not without problems. The country’s libel laws heavily favor the plaintiff, resulting in significant “libel tourism,” though reforms enacted in 2013 appear to be a step in the right direction. Press freedom advocates are less satisfied with the conclusions of the November 2012 Leveson report, which suggested the adoption of statutory press regulations to solve the ethical crisis revealed by a scandal over illicit phone hacking by journalists. The use of superinjunctions also poses a threat to freedom of expression; these court-issued gag orders are an excessively powerful tool in the hands of those who can afford the legal expertise to secure them. Another issue that sets the United Kingdom apart from the best-performing European countries is the persistence of occasional attacks and threats against journalists, especially in Northern Ireland. The economic crisis has shed light on, and often exacerbated, deep-rooted problems in the media environments of Europe. These include the cozy relationships between politicians and media owners, government hostility toward critical reporting, and violence against journalists in the course of their work. However, the EU still easily outperforms the world’s other regions, and the recent decline in press freedom has been recognized by European policymakers. As governments contemplate an appropriate response, journalists across Europe are already turning to new media as an outlet for their work. The proliferation of digital media—whether online versions of newspapers, purely web-based news organizations, internet broadcasters, or individual blogs—serves to counteract the contraction of the print sector and often frees journalists from the restrictions and conflicting interests of large public or commercial institutions. In addition to addressing the problems affecting the media offline, policymakers will need to ensure that the legal, political, and economic freedom of online journalism is adequately protected, so that it can evolve into a robust alternative to traditional sources of unbiased information and in-depth investigative reporting on the key issues facing the public. This entry first appeared on the LSE EUROPP Blog. Jennifer Dunham is a senior research analyst for the annual Freedom of the Press and Freedom in the World reports at Freedom House, a U.S.-based independent watchdog organization dedicated to the expansion of freedom around the world. Zselyke Csaky is a researcher for Freedom House’s Freedom of the Press report. She holds master’s degrees in International Relations and Human Rights. Her research interests include freedom of expression, minority rights, privacy, and European affairs. This entry was posted in Greece, Italy, Spain, Uncategorized, United Kingdom and tagged Journalism, Media Systems, Press, Press Freedom. Bookmark the permalink.